Very often, you might want to send additional information about the user who is answering your questionnaire through the SurveySparrow widget. If you are getting feedback from the users of your application, you already know who is answering, since they have already logged in. Asking for the name and email address again in the widget doesn't make much sense. Also, when you ask a question, addressing your users by their name offers more personalization. With the ability to send variables through SurveySparrow widget it is possible to do so. There are no misconfigurations in the script embedded. For example, if the user has set the widget to show only if the URL has "billing" in it, the widget will not appear for any other scenario. The survey is not in the Private mode. There is no cut-off date set for the survey. The channel in use is not paused. The response limit is not crossed. The number of responses set by the user(in survey settings) has not crossed the limit. The survey is not taken already when the user has enabled only a single submission. The respondent has not closed the window of an auto-triggered survey. You have to set a configuration to stop widget from loading when the page loads. Setting triggerOnLoad to false will stop the widget from loading, on page load. By default, this is true. In order to get the name and email, you might want to trigger the survey only when the users have logged in. Setting triggerOnLoad to false would be useful in these kinds of use-cases. Add variable names in the text field and click enter. In this example, we have added the name and email address as the variables in the survey. Once the user has logged in, you can trigger the widget and set the variables using the following code. In this manner, your survey will have access to the variables name and email address. 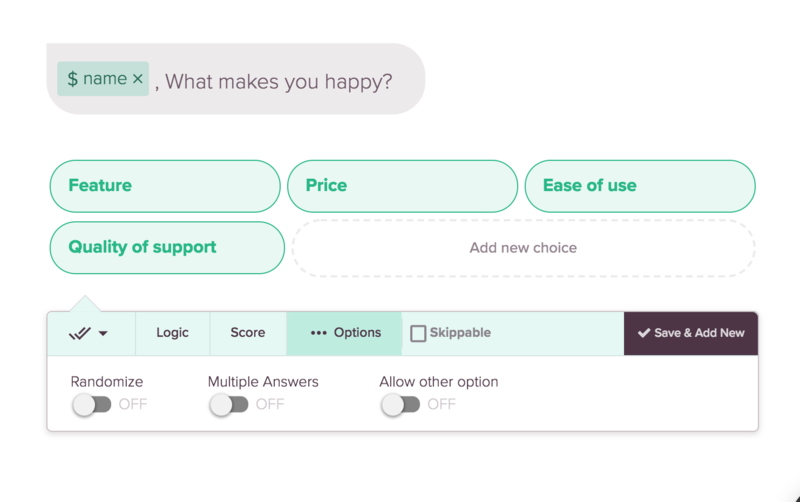 Additionally, you can also use the variables in the questions to give a more personalized experience. Configure the variable in the question. When a logged in user answers the widget, he will see his name. Once the user starts answering, a response entry will be created with the user details, name, and email. In case you would like to remove the widget based on a specific user action, you can call the following code.